You could start printing on fabric in the next few minutes—free! Inklingo is . 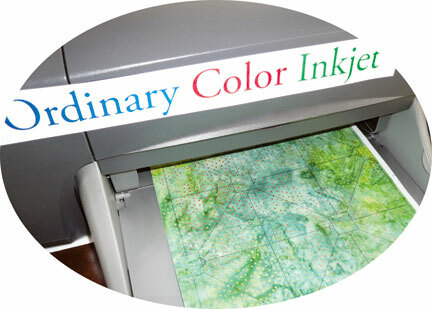 . . a digital file which prints shapes on fabric with any ordinary Inkjet printer. Inklingo (US Patent 7,814,832) is the quilting tool we've always wanted. Inklingo is an alternative to English Paper Piecing, Acrylic Templates, Paper or Foundation Piecing and Die Cutters. It is amazing for machine piecing, hand piecing, and appliqué. Inklingo is . . . for all types of piecing and appliqué. Inklingo is . . . so innovative, it is patented! Just print, cut, and sew. Iron freezer paper to the fabric, and print perfect shapes with Inklingo. No measuring. No math. No special tools. You can even cut with scissors if you don't have a rotary cutter. Inklingo is the best way to go straight to the fun part. Choose your fabrics, start sewing sooner, finish faster! Inklingo is a simple and economical way to save time and make better quilts. compatible with scraps, Jelly Rolls, nickels and even "fussy cutting"
On this site, when the text is green, it is clickable. PRINT - CUT - SEW is simpler, faster, more accurate, and makes complicated designs simpler. As soon as you see those perfect shapes printed on the fabric, you know you will be happy with the results. I am so convinced that you will love Inklingo, that there are two free shape collections! From those pages you can Add to Cart, Checkout, Download, and start Inklingoing in the next few minutes! Iron freezer paper to the fabric and PRINT the shapes on the fabric, as if it was paper. CUT the shapes apart with a rotary cutter or scissors. SEW by machine or by hand. Every step is simpler with accurate lines on the fabric. Inklingo is fabulous for young, cool quilters and mature, wise quilters, whether they use a rotary cutter or scissors. "Seeing Inklingo reminds me of the first time I saw a rotary cutter!"